London-based writer Carla Grauls has been named winner of Falmouth University’s 2013 Nick Darke Award. Carla, who develops scripts for stage and screen, enjoys recognition in Italy, South Africa, America and the UK. Previously long-listed for the Verity Bargate Award, she won the Euroscript Screen Story Competition in 2009 and was selected for the Puglia Experience Screenwriting Fellowship in 2011. Now in its sixth year, the Nick Darke Award receives entries from across the globe. This year’s judging panel included, among others, Drama Commissioning Editor for Radio 4 Jeremy Howe; Associate Director (Literary) for the National Theatre Sebastian Born; and Molly Dineen BAFTA and Royal Television Society award-winning documentary director, cinematographer and producer. 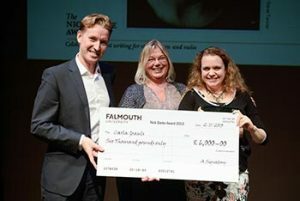 The Award commemorates Nick Darke’s contribution to writing and Cornwall’s writing community. Funded by Falmouth University, the Award considers stage plays, screenplays and radio plays with an environmental theme – reflecting Nick’s own passions. For the latest Nick Darke Award news, follow @FALMPW and #nickdarkeaward on Twitter.